Apple's tablet PC has been causing wild speculations for months and has filled the newspapers page-wise. Apple's boss, Steve Jobs, can therefore chalk up an immediate success: Apple could take delight in a vast and, at the same time, free media interest for several months. Yesterday, so Wednesday, Steve Jobs finally presented the multimedia device that has been awaited with anticipation in Yerba Buena Center for the Arts in San Francisco: "We call it iPad". The Apple boss launched his new tablet PC in the hall amidst thunderous applause, while hundreds of thousands tried catching at least a few live glimpses of the pictures on one of the numerous streaming portals. However, netbooks aren't an issue for Jobs. Thus Jobs is cited with the words: "... Netbooks aren't better at anything ..." and "... Netbooks will have a hard time justifying themselves in this market ...". What Apple's company chief means is obvious: The iPad is supposed to establish itself beside notebooks and Smartphones as a third product category. But: Jobs misjudges that just exactly the comparison with netbooks reveals his iPad's weaknesses – see the list below. Nevertheless, numerous market observers have predicted that Apple will have a similar success with the tablet PC as already with the iPhone. Especially the media sector loves to hear this, as publishers hope for a lucrative income source in digital magazines and newspapers with fee-based content. So, even German media companies are watching the collaboration of Apple and the "New York Times" like a hawk. A manager of the "New York Times" also directly demonstrated how the newspaper of tomorrow is to look like live at the event. The dream is evident: The iPad is to assist the entire market of electronic publications to a breakthrough, to which for example also digital newspapers belong. E-Books as a mass industry, digital newspapers supplemented by fee-based contents, such as high-definition videos and interactive graphics. It's logical that no one wants to miss this opportunity. But Apple also receives support from the entertainment and gaming sector. Heavy weights like Electronic Arts (EA) present games already customized for the iPad, such as the race game "Need for Speed: Shift". However, a moment after announcing the iPad's official details, the Apple fanboys' usual storm of enthusiasm was replaced by a frown among some event observers. 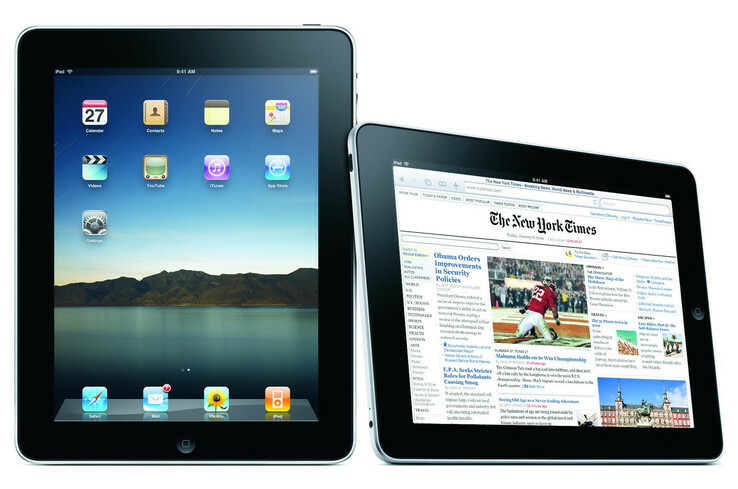 Is Apple's whole multimedia tablet package really so revolutionary or has the iPad simply been "overhyped"? We've already thought about the new iPad previous to the first hands-on test in our editorial office. Here is our analysis. 1. 4:3 instead of widescreen format? Inconceivable: Why has Apple selected a 4:3 format for the iPad's display? Many multimedia and video contents are created in a 16:9 screen size today. The 4:3 screen size is simply obsolete for modern multimedia devices and tablet PCs. Who'd want to enjoy their blockbusters and favorite movies cut off at the edges or even compressed? A webcam is a must-have for mobile terminals because video chats are supported by all common instant messaging clients, such as AIM (AOL Instant Messenger), ICQ and telephony applications, such as Skype, and simply are part of modern communication. Not so by Apple: Microphone built-in, webcam left out. Unimaginable in times of Facebook, Myspace, Skype, Twitter and multimedia: Practical work without switching between single applications? Today's user is accustomed to operate several applications at once. After all, time is money and netbooks most certainly can't be replaced with this restriction in "multitasking", Mr. Jobs. Just what did the Apple boss have in mind with that? What still is justifiable in the Smartphone, iPhone, is simply a no-go for a multimedia and surf device. The iPad currently doesn't bid support for Adobe's Flash. The missing flash support will likely be a fierce disappointment for all users in view of flash animations and movies to be seen on websites everywhere. Not only Apple fans will have expected innovations in terms of usability and ergonomics in the virtual keyboard, as well. Therefore, the disappointment about the practical implementation of the virtual "keyboard" in the presently introduced iPad is logical. You type in an upright view and writing will likely turn out to be an uncomfortable arduous effort also on the iPad because of the (virtual) keyboard layout. The iPad has fast wireless communication via Bluetooth, WLAN and even fast internet via UMTS can be acquired for a surcharge in some models. But, the user has to execute data synchronization via the included, special "Dock-Connector-to-USB-Cable". Incredible! Apple's iPad solely has a headphone socket and 30-pin docking port as connections – without counting the SIM card slot in the UMTS models. The impractical USB adapter cable has to be used for connecting to another computer via USB. An adapter cable (included) is even needed for coupling to an electrical outlet for power supply. 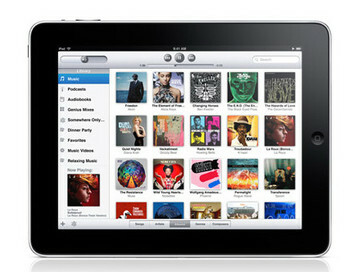 The iPad's operating system (OS) is based on the iPhone OS. That's why many disadvantages, like the missing "multitasking" and flash support, are self-made. Apple has simply forgotten to give the iPad a "real" operating system (OS), such as Mac OS X. If the special Apple A4 computing unit as a System-on-a-Chip (SoC) would have sufficient computing power is uncertain. Apple didn't accomplish implanting a cardreader into the iPad. Again, adapters have to do the job. But this time, two are needed right away as a "Camera Connection Kit" for the iPad's docking station. One adapter for SD memory cards, the other serves as an adapter for USB devices. If the USB port is suitable for USB peripherals, such as external hard disks and memory sticks, is still not known. According to Apple, only "pictures and videos" from digital cameras can be transmitted with it. The Apple iPad isn't state-of-the-art in terms of home entertainment. Thus, Job's multimedia tablet lacks an integrated interface for transmitting HD content. HD videos can be downloaded from iTunes but can't be rendered without losses on the high-end LCD or plasma TV in the living room. The list of weaknesses of Apple's new tablet PC can be continued. You can easily cope with the fact that the new iPad now doesn't have an integrated telephone onboard. Not as easy will likely be the fact that the iPad only supports applications from the Apple App Store and Apple once again creates a closed "eco-system". That makes, for example publishers, who join in on Apple's iBooks in the iTunes Shop, automatically dependant to a part. 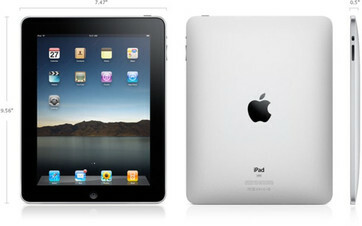 On the pro side, Apple's iPad can definitely score with a starting price of about 500 dollars. Industry observers presumed a price of almost 1000 US dollars for the basic model even during the event, before the official price was announced. Looking closer at the configuration, the price is relativized – especially for that of the UMTS models. The bottom line is that with the iPad, Apple has achieved bringing a chic and easy to use multimedia device onto the market. No one is more adept at marketing and, at the moment, no one can copy Apple in terms of easy usability. However, the iPad is at present undoubtedly a not fully developed product. Apple has blundered specially in details and the important multimedia functions and thus unnecessarily gives its tablet PC a tough start. Will the Apple iPad help the e-papers break through?